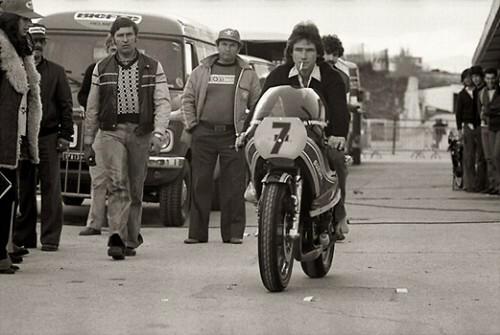 Another iconic part of motorcycle history for me and a true legend as far as I was concerned was the infamous Number 7, BARRY SHEENE. 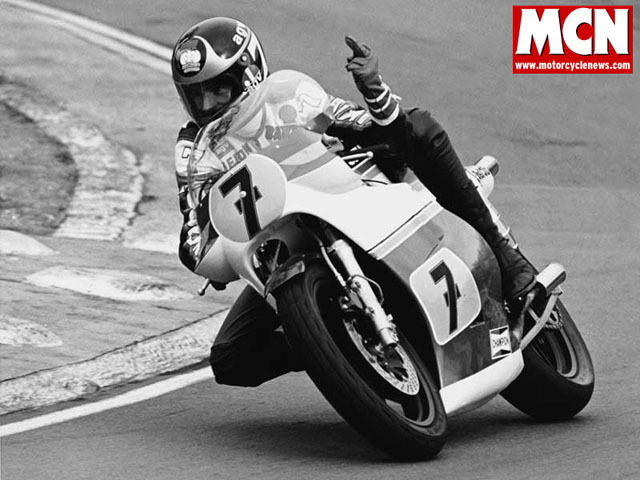 As a teenager I was so enthralled to watch him race on the tv and follow him in Motorcycle news every week, he had an immense impact in my life. 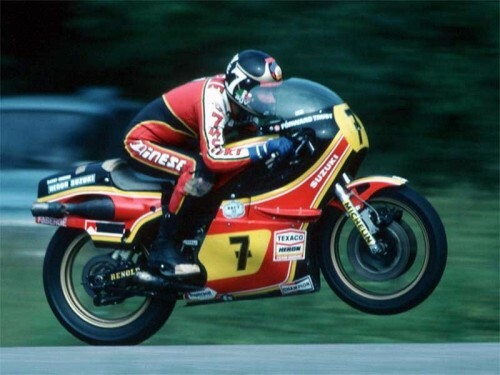 I used to get to watch him race at Snetterton Race track in Suffolk/Norfolk where i grabbed an old centurion open faced helmet with no guts on the inside, I used to roll the local Bury free press up and tape that to the inside and then i would stand on the main road to Thetford and hitch hike a lift on the back of the bike to the races, and run down the side of the track where the fields were and hop over the hedge, as I had no pocket money and I loved the sound, the smell and the whole enchilada that emulsified Motorcycle racing. 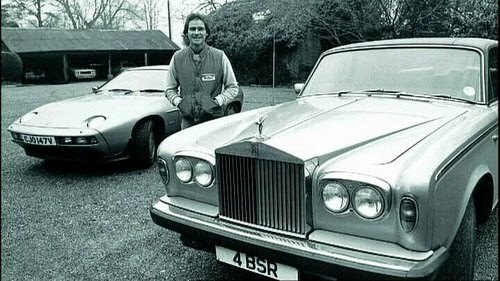 I was hitch hiking after the race one year and this Rolls Royce was heading my way, I stuck my thumb out and the driver shook his head to say no, me being a bit of a lad, Gave him the 2 finger salute. 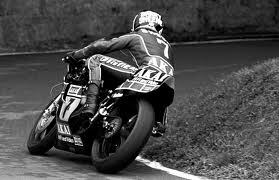 Oh my god, as he went passed me, I saw it was my hero, I felt so gutted. I had flipped of my bloody iconic legend !!! 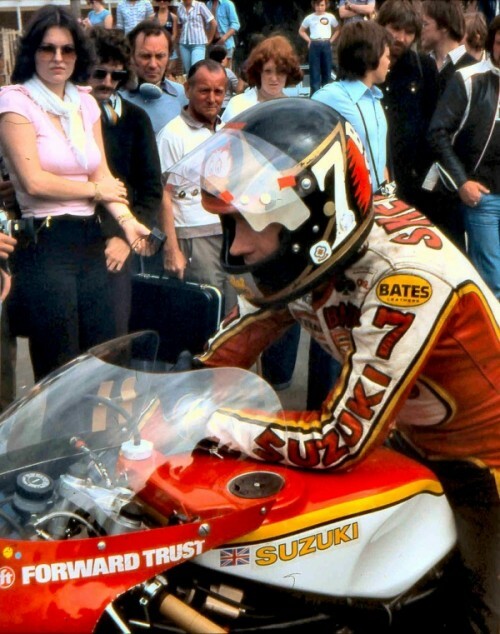 he was a true hero for me, as to see a Brit race against the world and always do well, made me kinda proud, I so wanted to be him, he had the looks, the bikes and of course the birds. I followed his career and I too moved to Australia where I saw him with Peter Brock. 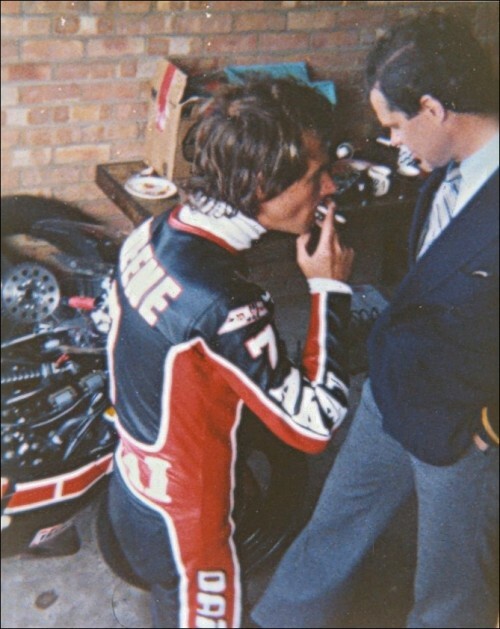 Sheene was born in London, the second child of parents Frank (resident engineer at the Royal College of Surgeons) and Iris. He grew up in Queen’s Square, Holborn, London. 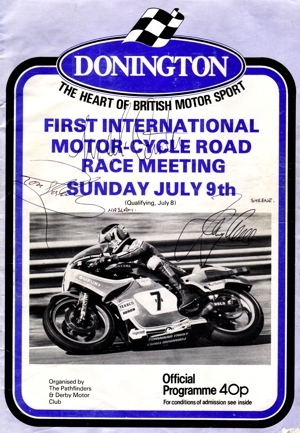 He became the British 125cc champion aged just 20, and finished second in the World Championships for that class a year later. 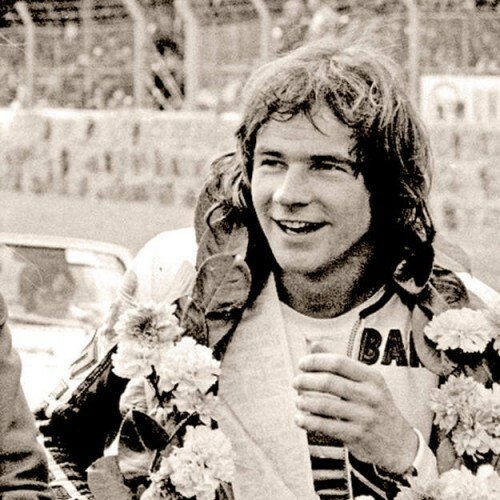 Sheene won the newly formed Formula 750 European championship for Suzuki in 1973. 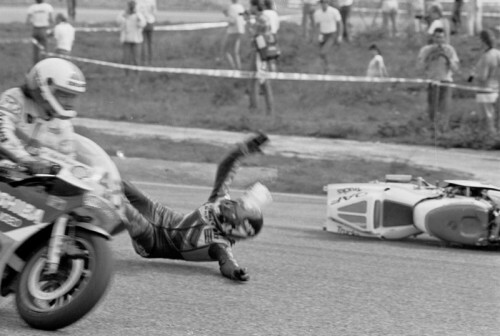 A spectacular crash at the Daytona 200 in the 1975 season threatened to end his career, breaking his left thigh, right arm, collarbone and two ribs, yet he recovered and was racing again seven weeks afterwards. 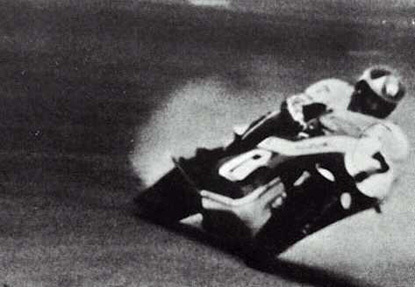 In 1973, he won the Formula 750 World Championship. 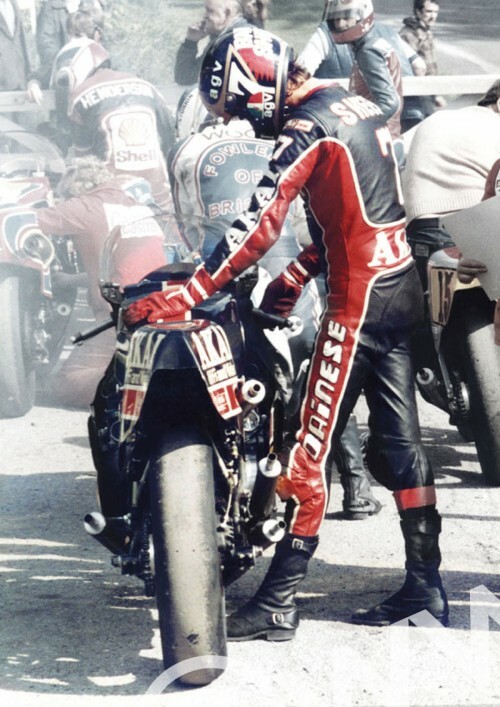 In the 1976 season, he won five 500cc Grands Prix, bringing him the World Championship. 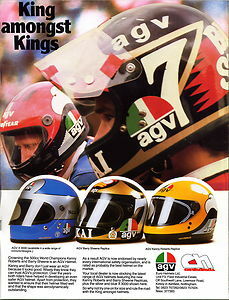 He repeated as champion in the 1977 season with six victories. 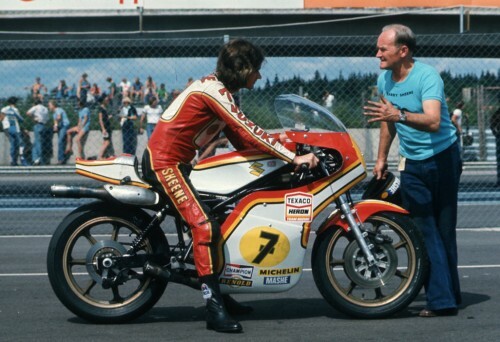 Sheene’s battle with Kenny Roberts at the 1979 British Grand Prix at Silverstone has been cited as one of the greatest motorcycle Grand Prix races of the 1970s. 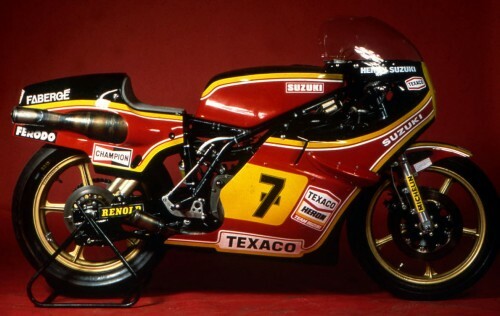 After the 1979 season, he left the Heron-Suzuki factory team, believing that he was receiving inferior equipment to his team-mates. 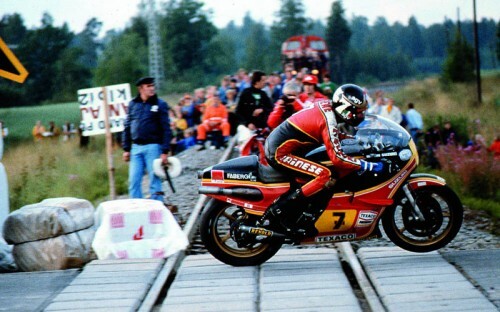 He shifted to a privateer on a Yamaha machine, but soon started receiving works equipment. 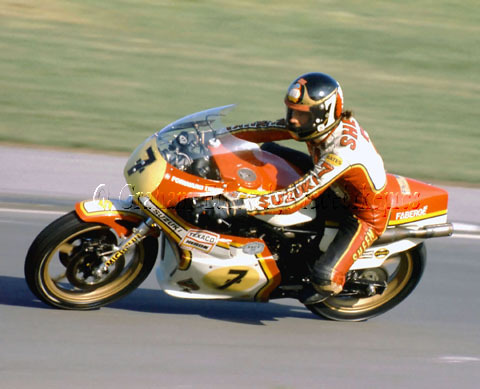 In 1981, Kenny Roberts was the reigning World 500cc Champion for the third time, and Barry Sheene, now on a competitive Yamaha, was determined to regain the championship. 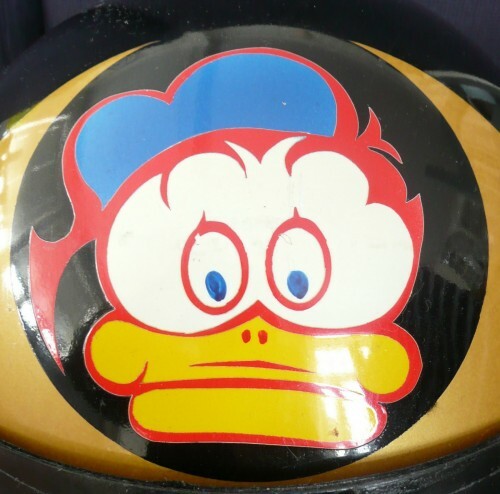 Ironically, Sheene and Roberts battled all season and let Suzuki riders Marco Lucchinelli of Italy and American Randy Mamola beat them for the top two spots. 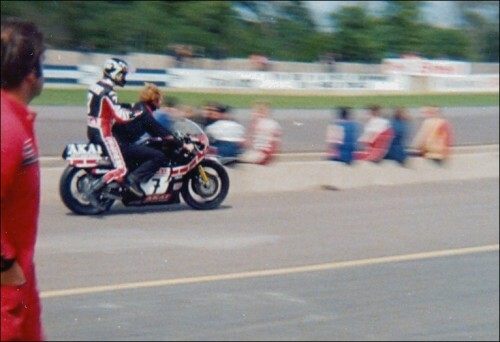 Roberts finished third and Sheene fourth for the 1981 championship. 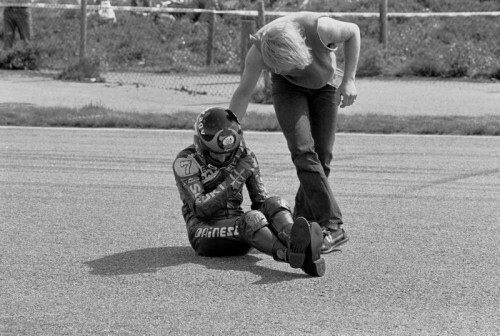 A crash during the 1982 season largely ended Sheene as a title threat, and he retired in 1984. 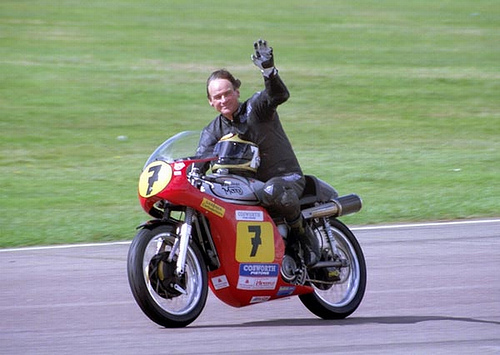 He remains the only rider to win Grand Prix races in the 50cc and 500cc categories. 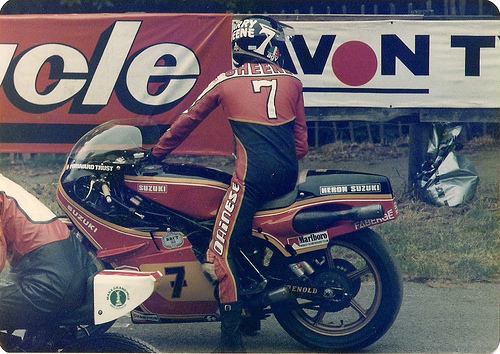 Sheene was known for being outspoken in his criticism for what he considered to be dangerous race tracks, most notably, the Isle of Man TT course, which he considered too dangerous for world championship competition. 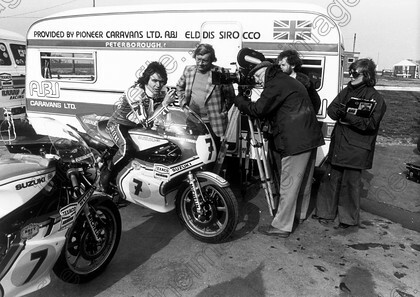 He was a colourful, exuberant character who used his good looks, grin and Cockney accent to good effect in self-promotion, and combined with an interest in business was one of the first riders to make a lot of money from endorsements. 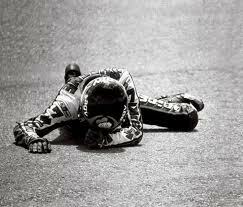 He is credited with boosting the appeal of motorcycle racing into the realm of the mass marketing media. He also tried his hand as a TV show host, including the ITV series Just Amazing!, where he interviewed people who had, through accident or design, achieved feats of daring and survival (including the former RAF air gunner, Nicholas Alkemade, who survived a fall of 18,000 feet without a parachute from a blazing Avro Lancaster bomber over Germany in March 1944). 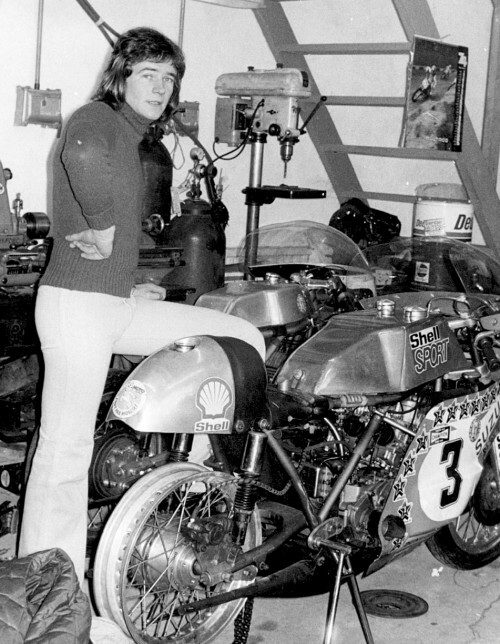 Sheene and his wife Stephanie also starred in the low-budget film Space Riders. 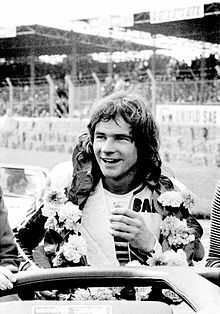 In 1975 while on crutches, Sheene met fashion turned glamour model Stephanie McLean, who was Penthouse Pet of the Month for April 1970 and Pet of the Year in 1971, while they were working together on a photoshoot for Chrysler. After she had divorced her first husband, the couple married in 1984, and had two children, a son and a daughter. 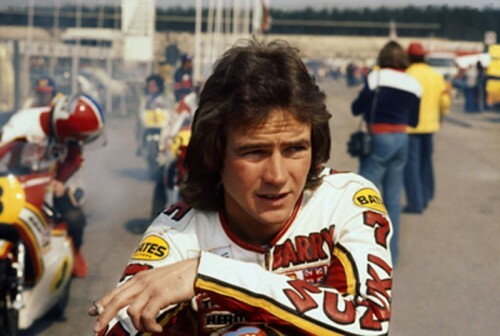 The Sheene family moved to Australia in the late 1980s, in the hope that the warmer climate would help relieve some of the pain of Sheene’s injury-induced arthritis, moving to a property near the Gold Coast. 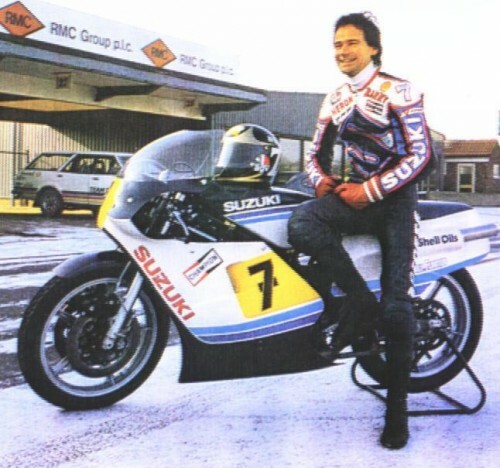 He combined a property development business with a role as a commentator on motor sport, first at Nine Network with Darrell Eastlake, then moving with the TV coverage of the motorcycle Grand Prix series to Network Ten. 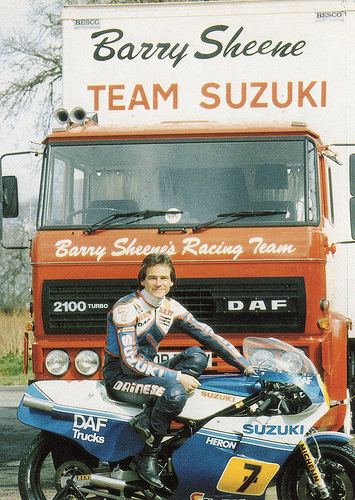 In later years, Sheene became involved in historic motorcycle racing. He died in 2003 aged 52 of cancer of the oesophagus and stomach, and is survived by his wife Stephanie and two children. On a side note, the obscure Eric Idle song “Mr. 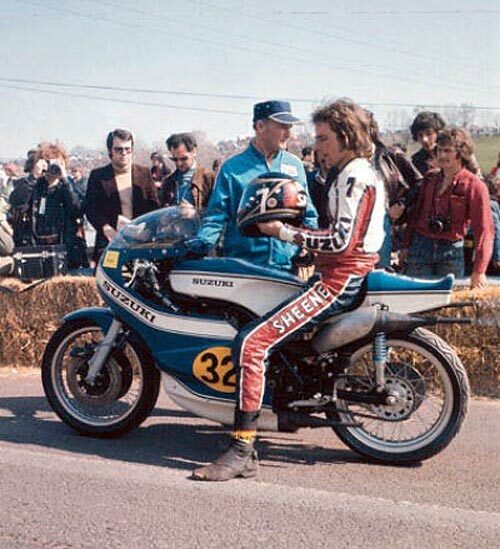 Sheene” which describes “Mr. 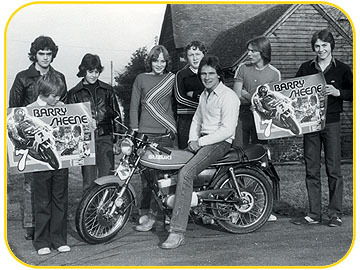 Sheene’s riding machine” appears to be about Barry Sheene. It was released as a B-side of the 1978 single “Ging Gang Goolie” and is credited as released by Rutles-offshoot duo “Dirk and Stig.” He is also featured on one of Artist Grayson Perry’s Vases My Heroes (1994).